In an attempt to catch up, I am posting my pics for the theme of abundance before the 11th hour next Thursday. I took them both yesterday (Feb. 26). The first pic is a limited view of our backyard as seen from a window in our back porch. You can see the ice and frost have practically obscured the view. The second pic is a wide-open view of our backyard with the National Heritage site of the “Esterhazy Flour Mill” in the background. The grooves in the snow are pathways snow-blowered out by my husband, so our three little Shih Tzus can run around the yard on the days when it is not too cold for them. To give you some perspective, the little bit of dark showing out of the snow to the left of the center path is our fire pit. Even more amazing is, we had a thaw and mild temperatures last week. There was almost half as much again of snow on the ground before the thaw. Now that’s abundance! Peeking out at the snow. As for the fantasy aspects of this story, I had the thought of a story about someone who felt limited and trapped in their life. The pic of the window is symbolic of how they limit their view of the world. As they struggle with their concepts, one morning they look out the window and see all the paths magically appearing. The protagonist didn’t feel he could get out at all because of the depth of the snow, but because he started clearing up his concepts, his mind provided paths for him to leave…and return (which was one of his fears). It would take a lot of work to make it readable, but it’s an interesting theory, especially concerning how our mind can actually create opportunities for us. How about you? Do you have any stories in your mind (or in real life) about all this snow? This entry was posted in Featured Photography and tagged abundance, Esterhazy Flour Mill, fantasy fiction from pictures, postaweek2011, snow, weekly photo challenge abundance. Bookmark the permalink. It seems there has been an abundance of snow all over! I looked up the The Esterhazy Flour Mill and learned that at one time the mill produced over 600 pounds of flour per hour! To think it only closed down in 1981… oh the tales it could tell, huh? Hi, Marge, thanks for dropping by. You’ve taken the time to do something I hadn’t done yet–research the Flour Mill. I didn’t know those two facts. That could be another evidence of abundance I suppose, although it doesn’t really show in the picture. 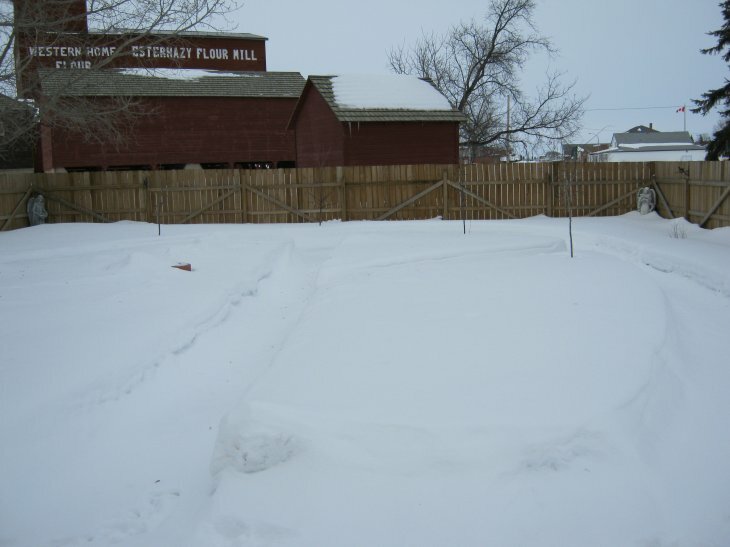 The Esterhazy Flour Mill is cared for by a group called “The Friends of the Flour Mill.” They took such good care of it that the National Historical Society of Canada approved greatly of the way it had been kept and the beautiful grounds it is located on. They named it just last year as a National Historic Site of Canada. We were all very proud of that in Esterhazy (which is a small but thriving town of about 3,000 population). Despite the fact that your town is in the foothills and mine is on the prairies, it looks like there are many similarities between the two. I am the Performing Chair of our town’s Arts Council. We are the first arts council in Saskatchewan to include the literary arts in our mandate, for which I *cough cough* had a little something to do with. It’s nice to meet a small-town girl, even if you have big-city credentials 😛 I’m a big-city girl transplanted to small prairie town farmland and am finding it exciting and a challenge. Oops, got carried away chatting. Anyhow, nice to see you. Wow…truly an abundance of snow for sure…as for me…the comparison is the thought of the poor honey bees and their need for an abundance of food stores to help them weather through the bitter cold. Starvation is the most “abundant” form of destruction to a honey bee hive. The bees get soooo cold, they don’t move to the honey to eat and replenish their strength. You see they heat their hive by fanning their wings. This takes a lot of energy. Thanks for getting my mind to thinking! Great insights! Snow snow snow !! Hope spring comes in abundance now ! Hi, K – nice to see you here. See my reply to nrhatch above. It’s very cold here (southeastern Saskatchewan) right now dropping to -10 to -20 Fahrenheit overnight. Fortunately, we have an abundance of heat. That makes it nice. Thanks for dropping by – now I have a quick link to go and visit your interesting blog. Wow, that certainly is an abundance of snow! It seams like such a long time since we had snow here in the UK. We never had as much as you do though. On another note, if I didn’t know any better, I might think that this was not snow but the result of an accident at the flour mill. That is a really nice looking building. Does it still operate? 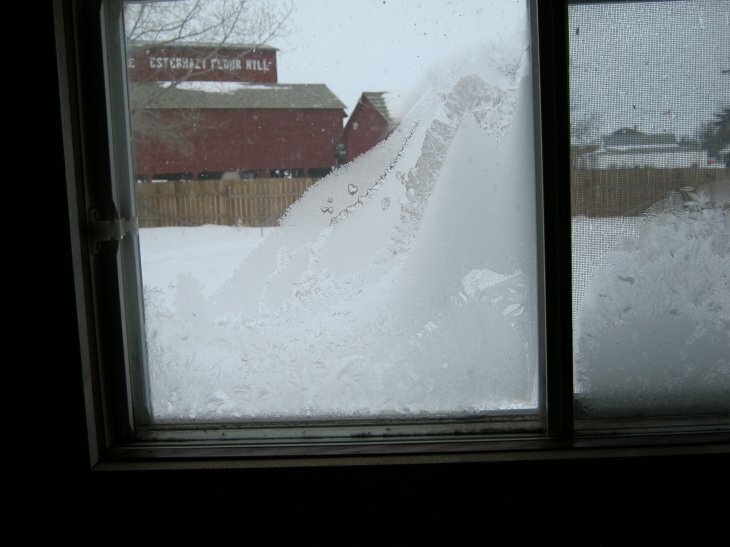 I never thought of looking at the snow that way. When it’s daylight tomorrow, I’ll take another look. The building is cared for by the Friends of the Esterhazy Flour Mill, and they are meticulous in their maintenance, grooming and upkeep. The mill is not operating now, although it still has all the equipment. As a (Canadian) National Historic Site, the Esterhazy Flour Mill is shown off as a tourist attraction and you can take tours through it in the summer. My husband and I feel honored to have such a beautiful and significant monument to the prairie pioneers just beyond our back yard. I’ve always intended to write a story involving snow, considering it’s winter for so long around here, but I’ve never got around to it yet. I guess I’d just rather think about warmth! Gosh, harmamae, if you have a feeling or idea to write about snow, you should go for it. Looks like your Muse is not intimidated by winter weather lol. I can think of all kinds of ideas for plots revolving around snow. We have a friend in the Army, who was trained in Alaska for cold weather combat. He was sent to Iraq. It’s not really funny, at least it wasn’t to him, but you could write a story of the reverse…someone trained for the desert and sent to snow country. It doesn’t have to be about the military either. Good ideas 🙂 Unfortunately I have to finish writing a history paper first, before I think too much about other writing. Oh, lordy…look at all that weird, white, freezy stuff on the ground. The end is nigh! Yes, I can see it now: in the antique building ahead dwells a creature too horrific to look upon. Nuclear fallout has mutated its once lithe, agile body into a twisted parody of itself. Wouldn’t it be ironic if the only living humans are sterile and cannot reproduce. Ultimately the twisted horror is left to repopulate Earth.